SEYMOUR — Whether or not an opponent provides a strong challenge on the trails, there’s always one thing a runner can race against: the clock. So when Woodland’s Jill Brotherton crossed the finish line on Seymour High’s 3.05-mile course Sept. 19, her exclamation of a personal-best time by more than a minute was the best indicator of the day’s success. Brotherton finished fifth overall in 21 minutes, 28 seconds. That was also fifth among Woodland runners as the Hawks girls swept the top five positions in easy victories over Seymour, Naugatuck and Waterbury Career. The story was almost the same on the boys side as the Hawks claimed five of the top six spots in the race. Both Woodland squads improved to 5-0 on the season with the victories. Personal-best times are impressive, but they don’t mean quite the same thing as they do on a standard track. That’s why Lownds wanted his runners to pay attention to their own watches as they crafted race strategies. Jaden Young (20:21) won the girls race. 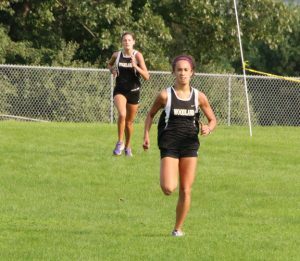 Following closely behind were Emma Slavin (20:25), Calisa Costanzo (20:32), Chloe Poulos (20:33), Brotherton and Brooke Iannone (22:22) to help Woodland claim the top six finishes. 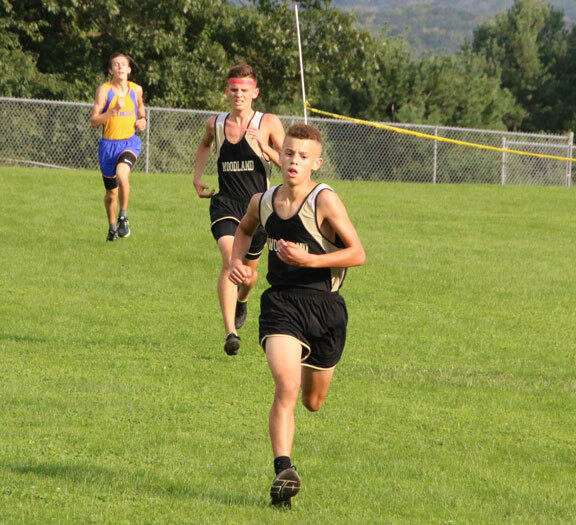 Chase Young pulled away for a win in the boys race with a time of 17:31. Greg Aldrich (17:34) was second, while Kyle Crowell (17:45) was fourth, Marty Swercewski (18:04) was fifth, and Colin Slavin (18:05) was sixth. The results from the first few weeks have been encouraging for Lownds and his Hawks. Woodland’s youth is talented. On the boys side, Young and Slavin are freshmen while Swercewski is a sophomore. It’s a similar story on the girls side, where Young and Iannone are sophomores and Poulos is a freshman. There are 17 freshmen and nine sophomores on the Hawks’ rosters. Woodland is set for another meet Tuesday versus Holy Cross, Watertown and St. Paul Catholic.